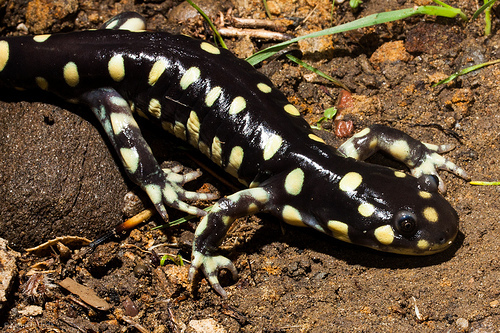 The California tiger salamander (Ambystoma californiense) is a large, stocky, terrestrial salamander with a broad, rounded snout and gorgeous black-and-yellow body. These amphibians are restricted to vernal pools and seasonal ponds in grassland and oak savannah communities in central California. The primary cause of their decline is the loss and fragmentation of habitat through human activities and encroachment of nonnative predators.